Heavy duty mobile dispenser trolley for safe storage and retrieval of ribbon wound steel strapping. The mobile dispenser trolley for wound steel strapping is easily portable and perfect for use in a warehouse or other workplace that has the need to use steel strapping for securing parcels for storage or for transit to other places. Weighing 16.4 kg, it can be moved using the rubber wheels and tubular steel handle, making it fine for use in almost any area of the workplace. Portability is one of the most important features of this unit as it means that items can be packaged at different locations in the workplace. 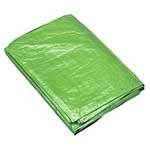 This type of strapping is used mainly on pallets and wooden packing cases which need to be secured properly before being moved. The mechanism works both ways so the wound steel strapping can be both dispensed and retrieved back onto the reel after use. 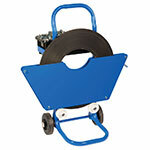 There are no steel strapping reels supplied with the trolley, but they are available to be purchased separately. Operators of the mobile dispenser trolley for wound steel strapping may also consider purchasing a range of steel strapping reels, and an adjustable Seal-less Combination Tool for steel strapping which reduces the need to buy other steel strapping tools, including strapping seals. The right equipment can make the packaging process much more efficient, and saving time on tasks like this can improve productivity in other areas.